GigaLayer Review 2019: Is GigaLayer a Good Hosting? GigaLayer is a Nigerian hosting provider that offers a great uptime service level agreement and 24/7 customer service. Nigerian website hosting provider GigaLayer was founded in 2007, after which they grew quickly and gained more than 500 customers within their first two years of operation. Their servers are located in the U.S.A., but their prices are advertised in American Dollars, British Pounds, Nigerian Naira, South African Rand, Ugandan Shilling, and Kenyan Shilling, which suggests a big African customer base. Their website is in English. Whilst they do not own their data center, they do own their servers which are colocated in an American data center. As always, this comes with the caveat of potentially slower website loads speeds and slower responses to technical issues. That said, they do state they have 24/7 on-site technicians as well as automatic notifications in the event of any issues. GigaLayer offers feature-packed plans that include Softacolous one-click installer (for an unspecified number of programs) as well as support for advanced scripting languages like Python and Ruby on Rails. They support PHP, but at the slower version 5 rather than the faster version 7. They also provide a backup facility, but it has to be configured manually. Finally, GigaLayer boasts about an SLA-backed 99.9% server uptime on all its hosting plans and VPS. They use the latest version of cPanel which they’ve customized to allow users to easily manage their FTP, subdomains, traffic statistics, website files, and backups. Although GigaLayer is not the cheapest provider on the planet, their prices are reasonable, and almost certainly attractive to Nigerian customers looking for American servers. Note that both SSL certificates and domain registration cost extra. Their plans are available on one, two and three-year terms, but there are no discounts for paying for longer-term plans upfront. It’s also a pity they don’t offer a month-to-month plan, but they do give a 30-day money-back guarantee. I am really impressed with GigLayer’s customer service. You can contact customer support 24/7 via telephone, ticket or email, and they also let existing customers log in to their website. If you like to support yourself, you can take advantage of the extensive knowledge base. GigaLayer started out in 2007. They scaled quickly to take on 500 customers in two years, and they rebranded to the current company in 2012. Their website is simple, but they provide excellent customer service plus an SLA-backed uptime guarantee. 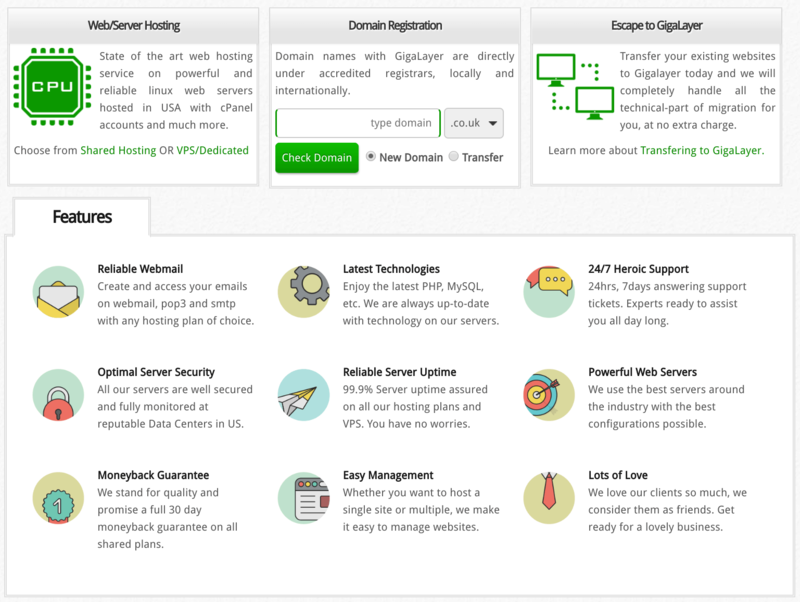 Check out GigaLayer’s web hosting options today! Wondering how GigaLayer stacks up against other Web Hosting companies? Enter any other Web Hosting company and we will give you a side-by-side comparison.